Time capsule provides snapshot of college life fifty years ago. Brooklyn College time capsule, buried in 1953, is unearthed in Walt Whitman Hall. In 1955, the brand new 500-seat George Gershwin Theater opened its doors in Walt Whitman Hall. Nearly 50 years later, the hall has been demolished to make way for the new Leonard & Claire Tow Center for the Performing Arts, but not without yielding an important piece of Brooklyn College history. Construction workers made a surprising find when they were chipping mortar off the cornerstone of Whitman Hall in last semester: A metal box. Once opened, it became clear that the box was a time capsule. On April 15, 1953, Brooklyn College president Dr. Harry Gideonse, who served from 1939 to 1966, and Brooklyn Borough President John Cashmore held a small ceremony to lay the cornerstone for Walt Whitman Hall. “Before a sun-soaked crowd of 1,500 viewers,” the college newspapers Kingsman and Ken reported, Gideonse and Cashmore placed a watertight copper box containing, among other things, President Gideonse’s card, undergraduate and graduate bulletins, Mayor Vincent Impellitteri’s proclamation of New York City’s tercentenary, and a commemorative medal from President Dwight D. Eisenhower’s inauguration. An April 21 Kingsman article elaborated on the ceremony, describing Dr. Gideonse as a "great salesman" who helped sell the project to the city’s budget director. "Brooklyn, under the leadership of Dr. Gideonse, has become a national college," said the borough president in the article. The time capsule is now housed at the Brooklyn College Library archives, where the capsule and its contents will be preserved under the direction of Slava Polishchuk, the college’s conservator. After the items undergo conservation treatment and are placed in archival enclosures, they will be made available to the public. Marianne LaBatto, the college archivist, emphasizes that Brooklyn College’s Library is serious about preservation. The storage area for archival material is temperature controlled and the staff employs a series of Preservation Environment Manager (PEM) units to monitor humidity and temperature, which must be kept at certain levels to slow aging and deterioration of materials. 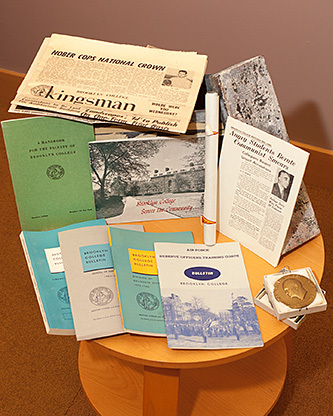 Once the items are preserved, LaBatto encourages students, staff, faculty, and members to visit the archives and view the Whitman Hall capsule, as well as the Boylan Hall time capsule, which was unearthed during a construction project in 1998. The Leonard & Claire Tow Center for the Performing Arts, designed by Pfeiffer Partner Architects, will include a double-height theater that seats 225, a grand lobby with two-story windows, a ground-floor exhibition space, performance and rehearsal space, classrooms, set design and construction workshops, and a fully outfitted recording studio. The center is set to open in 2014.